Case File #158 has just been opened for investigation over at CSI Color Stories Inspiration and today I'd like to share with you my second page as a CSI Special Investigator for March. First things first - did I follow all the clues?? The Scheme: all the colours are there, plus some neutrals and a couple of tiny splashes of accent colours. The Evidence: twine tied in a bow, three fancy fasteners, wood veneer bunny, stamped stitching (from my Georgie stamp set), vellum die cut splats (from my Quirky Kit), mixed fonts, long title, fabric print paper and fabric brad. 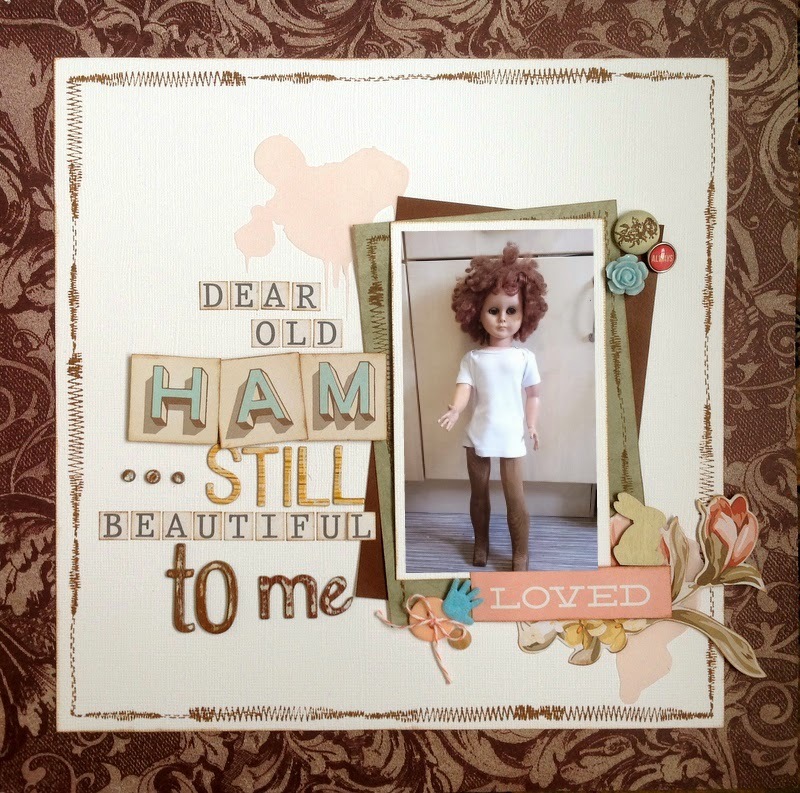 "Ham is about 50 years old. She has a wonky eye and wooden legs and her once glossy brown curls are now a little unkempt. Some people say she looks a bit scary, but she is still beautiful to me. I first met Ham when I was about four or five years old. A few weeks before Christmas, I found her hiding in a box under my Mum's bed. She was almost as tall as me, with chestnut curls and brown eyes which opened and closed. It was love at first sight, and I knew we were meant for each other. I didn't know if she was intended for me or for one of my sisters, so I deviously set about dropping what I considered to be subtle hints to my Mum, telling her how all I wanted for Christmas was a doll as big as me with brown curly hair ... years later Mum told me how hilariously UNsubtle my four-year-old attempts at hints were. We moved around a lot when I was a child and had to get used to leaving people, places and things behind, but somehow Ham always managed to stay with us throug thick and thin. Why does she have wooden legs? Well, that's because when she was about ten or eleven, there was a terrible incident where our Red Setter used her as a chew toy. I was distraught and would not allow her to be thrown away. Luckily, a kind old gentleman in the village who we called Grandpa Charles was an expert wood turner and he made a beautiful new pair of pins. Why is she called Ham? That's a bit of a mystery actually - until she was about 20 years old, she didn't have a name, because for some reason I could never decide what her name should be. Then my eldest son Richard decided that she was called Ham ... and that was that. Ham lives in Cornwall now, with my niece Georgia. I don't think she gets to play with Georgie's little girl Leila, because she is a bit cranky-looking these days, but Georgie keeps her in the shed because she couldn't bear to get rid of her. Maybe I should bring her home and see if I can restore her to her full glory - apparently there are "Dolls' Hospitals" ... "
You can see why there wasn't room to write this story onto my page! What a wonderful story! And I love the simplicity of your design. I DO love CAS!!!! Lucky Ham to still be round after all these years!!! Just love this page Annie and especially the story. How lovely that she had two leg replacements after the chewing episode. I really think you need to bring her home and use her as your muse in your scrap room! Oh I absolutely think you should bring her home and try and fix her up. What a gorgeous project. I LOVED the story of ham. I must have been about 9 when I got a similar doll and I will never forget her pink satin dress white socks and black plastic shoes. I had always wanted a sister and had three brothers. Imagine my delight when I discovered that her clothes fitted my middle brother ;) I used to make him wear her gear all the time... till it wore out :P WE also moved so much and I don't know what happened to her but I remember her most of all my toys. I love this layout too - such a beautiful design. This is gorgeous Annie. Wow this is awesome! And a cool subject too!! What a lovely, heartwarming story, Annie! I can see why she's so special to you.You've followed the prompts of the challenge to a tee and your page looks so well-balanced. Love the faux stitched borders! I also had a special toy when I was a child. It was an orange monkey, the size of a new-born baby, that I fell in love with instantly I saw it. My dad took me to the toy shop to suss out what I wanted for Christmas. I was only 5 or 6 but I still remember spotting "Maki" on the shelves. My dad was gonna go back and buy it secretly so it was going to be a surprise, but he had to buy it then and there for I wouldn't leave without it. I didn't throw a tantrum or anything, but there were quiet tears rolling down my cheek looking up at my dad in fear of losing my new-found best friend. In the end my dad agreed to buy it, but I had to wait until Christmas to get it. I remember the anticipation and joy when I finally got him. He's still somewhere in my parents' attic. I should look him up next time I go home and say hello. Thank you for reminding me of my own special friend!